The following dialog appears when you first start the software. The free version, this dialog will be displayed each time. 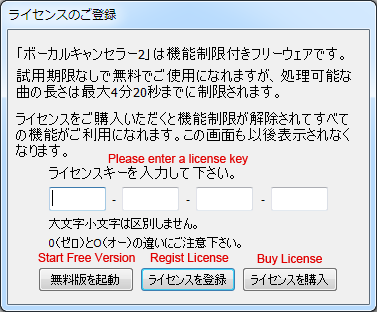 If you have purchased a license, please enter the license key and click [Resist License] button on the middle. Then you can use this software as a shareware without any restriction. And this dialog does not appear thereafter. You can purchase a license from the DLmarket by clicking on [Buy License] button to the right. The free version is started when you click [Start Free Version] button on the left. The free version, you can use for free with no trial period, but the length of the song that can be processed is limited to a maximum of 3min.20sec. If you purchase a license, time limit is released, you can use this software without any functional restriction. 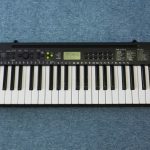 Following, I will explain in detail each operation parts of the VocalCanceller 2. Enter the WAV file name to be processed. You can choose to open the dialog by clicking the Browse button. In addition, because also supports drag and drop of files, you can also enter by release in the window by grabbing the file icon from Explorer. Extension only WAV files(.wav) that can be processed by this application. I is compatible with any sampling rate and bit width of each 8/16/24bit. It must be a stereo always source. Mono sound source can not be processed. 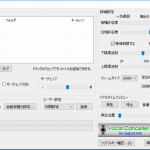 Adjust the parameters used for processing the vocal removal. Sometimes it will work almost the default Normally, vocal is hard to disappear by the sound source. Try to adjust the parameters by trial and error while checking the results in that case. It should be noted that it is not reflected when you operate the parameters during the execution of the process. When performing a spectral comparison with the left and right channels , you can set the tolerance of amplitude shift . The unit is dB ( decibels ) . Effect to turn off the vocal is strong tolerance is increased as it goes to the right . When performing a spectral comparison with the left and right channels , you can set the tolerance of the phase shift . The unit is ° (degrees) . Effect to turn off the vocal is strong tolerance is increased as it goes to the right . Effect to turn off the vocal about parameters of both go to the right will be strong , but the sound of the background to disappear together , the sound quality will be degraded . 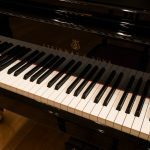 Rather than enhance the effect excessively , it is an art that meet the highest sound quality is to find the point at which the vocal disappears in left side as much as possible . The two parameters will act synergistically , respectively . Effect will be nearly constant to the right one , When you move to the left the other. Rather than move in the same direction the two , you can obtain better results by moving in the opposite direction . Vocals may remain even after the strongest effect by sound source . 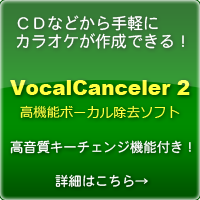 In that case, the vocal problems is not located in the center so it is possible, be removed in principle unfortunately is not possible. 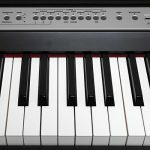 It should be noted that in the case of vocal extraction , the effect of leaving only vocal about moving to the left slider in contrast to the vocal removal will be strong . Because this is the operation of " off the component in excess of the tolerance ." It will become the sound quality was muffled considerably and approach to both left full , It can take to clean the only vocal and You'll move to the right a little . 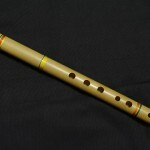 Like the vocal removal , there is the case that it can pick up together to the sound of the background by this sound source , but can not in principle prevent it . Specify the number of samples at the time of executing the FFT. Performs FFT read by the number of samples specified here from the source file, do the vocal removal processing in this application. Frequency resolution improves the larger the frame size, but the sound becomes obscured because the time resolution is reduced. The noise is more likely to occur processing accuracy is insufficient frame size is too small. It is effective in small, should be set to be larger in the song loose in a fast-paced song in general. Try setting to 8192 or more when the noise worries. 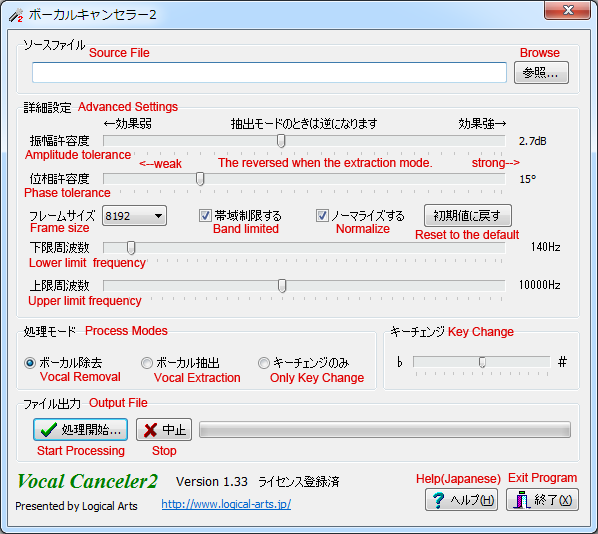 Make the vocal removal processing as limited to the frequency band in which vocal is included If you check this option. If unchecked, the settings in the [upper frequency limit] and [lower limit frequency] the following are ignored, do the vocal removal processing for the entire frequency band. Has the effect of preventing by limiting the bandwidth of the vocal frequency for performing the processing of vocal removal, background sound of vocal other than from disappearing together band-limited. It is useful to leave the sound of the Bass and Bass-Drums which is located in the center in particular. If you check this option, you can output up to a maximum pulling up the volume to the extent that it is not distorted. It can take so increases by one step. Remove the check and when you want to speed up the process even a little, if you do not want to change the volume. Reset to the default value of the amplitude tolerance, phase tolerance, lower frequency limit, the upper frequency limit. Make the vocal removal process only for frequencies above the frequency set here . It should be passed through as it is a lower frequency than this . It cut the frequency band lower than this in the vocal extraction mode . About 100 ~ 150Hz is suitable for male vocals , about 200 ~ 250Hz is suitable for female vocals . Make the vocal removal process only for frequencies below the frequency set here . It should be passed through directly to higher frequencies . It cut the frequency band higher than this in the vocal extraction mode . Overtones because it is included in the voice , It will differ to where the overtones or is spread by voice . Usually , it is sufficient about 10000Hz , but you can try to set a little higher if the high-frequency noise due to vocal worries . To remove vocal If you select "Vocal Removal" , to extract the vocal If you select "Vocal Extraction". If you select "Only Key Change", it is done only key change, bypassing the vocal cut processing. It will raise and lower in semitones pitch of the song without changing the tempo. Can be specified in the range of -7 ~ 7 semitones, to raise the key as you move the slider to the right to lower the key when you move to the left. It does not change the key processing If you specify 0. In principle, the sound quality will be degraded always key change process. Because the sound quality deteriorates significantly make big changes in particular, please use in a range of ± 4 as much as possible. 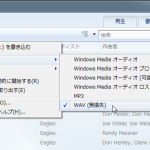 File save dialog box is opened, you must specify the WAV file name to be output. After that, I will start the process. Depending on the machine power, it takes about 30 seconds in the song about 5 minutes. Take longer if you add a key change process. Output file is 16-bit stereo fixed. 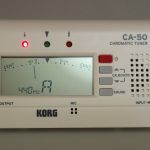 Sampling rate depends on the source file. Breaks the process by clicking during processing. Because the file has been created up to the middle, which is useful if you want to see while changing the parameters. Output file will be empty and still cancel the key change process.